Like other well components, you can load multiple log curve files for every well. 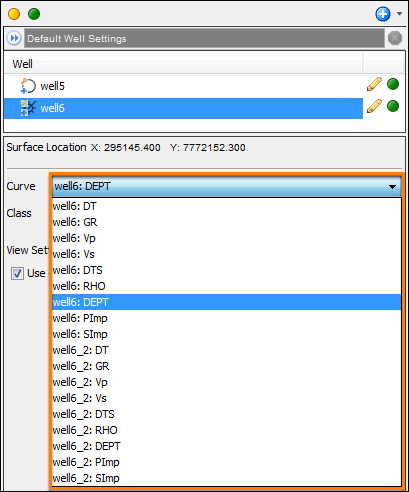 However, instead of using one component for each well deviation, checkshots and markers, you can use multiple log curve files to display the log curves of a well. Tip: You may want to use a/multiple default log curve sets for a well in all the sessions in a project. Otherwise, you can manually select other log curve set(s) to be used only for a specific session in the project and not affect users who are working in other sessions in the same project. See Defining Log Curves to load a LAS/ASCII file. Repeat the steps to add multiple files for the well. 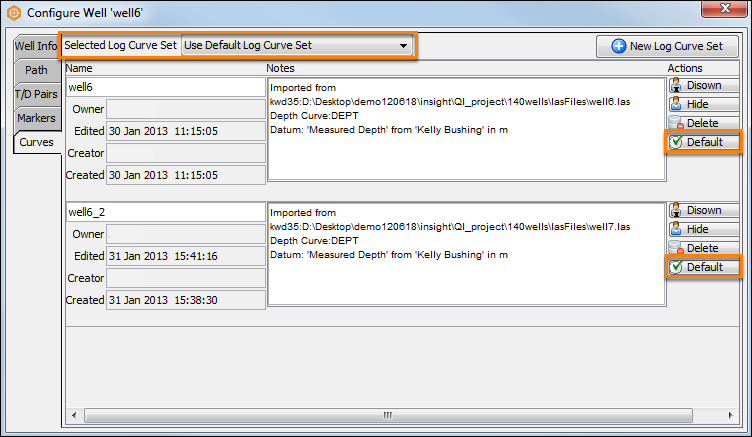 At Selected Log Curve Set, select Use Default Log Curve Set to use the default log curve set to define the well. Under the Actions column, you can select multiple default log curve sets. Do this by selecting Default at the respective files. You need to have ownership of the well to define the default files. Alternatively, you can manually select a log curve set(s) to be used for the well in the specific session. To do this, choose Select Log Curve Set Manually at Selected Log Curve Set. Under the Actions column, click the Selected button to select the log curve sets used for the well. The Selected circle(s) will be shown in green.